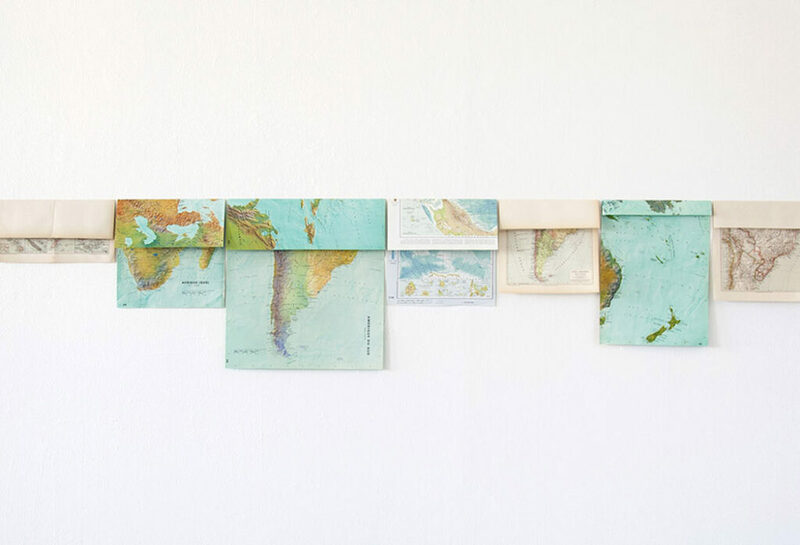 Marina Camargo, what is the point of a map with no words and no accidents? An atelier in Porto Alegre in the neighbourhood of Rio Branco (named in honour of the diplomat of the Brazilian borders) shares an affinity with Jan van Eyck’s Arnolfini Portrait. There a radical cartography is conceived, adapted to the geography of contemporary violence. At the back of the room, mirrored balls await a destiny – “I’m still not sure what I am going to do with them,” points the artist. Meanwhile, they capture the environment like the punctual mystery of the convex mirror (miroir de sorcière, i.e., witch’s mirror) of the Arnolfini. The balls on rua Cabral (named after the finder of Brazil) are globes of the here, engulfing the place. They are speculative (no longer specular) spheres, metaphor for Marina Camargo’s geographic eye. Her cartography is the best sorcery of geo-reason, just as geometry is witchcraft in Emily Dickinson’s poetry. Camargo’s opus is a guide for the erratic in internet times, like Paris was for Baudelaire’s flâneur and the mouse is a ship for the Google Earth snooper. The analytical hypothesis formed here is the scrutiny of the geographic eye under the model of the upturned compass. If cartography is coded representation, the objective here is to unsettle maps in their condition of controlled problems. “I consider maps like a language (or maybe a tool? 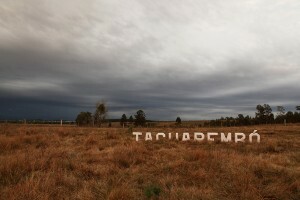 ), a means of thinking,” says the artist. If it’s a language, it’s aphonetic; if it’s a tool, it’s semi-useless; if it’s a means of thinking, it’s powerful. In view of the geographic afflictions, could there by a spatialized cartographic unconscious and tormenting maps and spatial nightmares through road maps that will never lead to an end, like Sisyphus and little Aylan? The worst torment is when Camargo places us in anomy, with no Google, portulanos and stars, no Verb, no Number, only zero. Marina Camargo’s cartography distinguishes between three concepts: space, place and nonsite, in a state of contaminations between space and thought, following the order of topological diversions: topophilia, topophagy and topoemia. 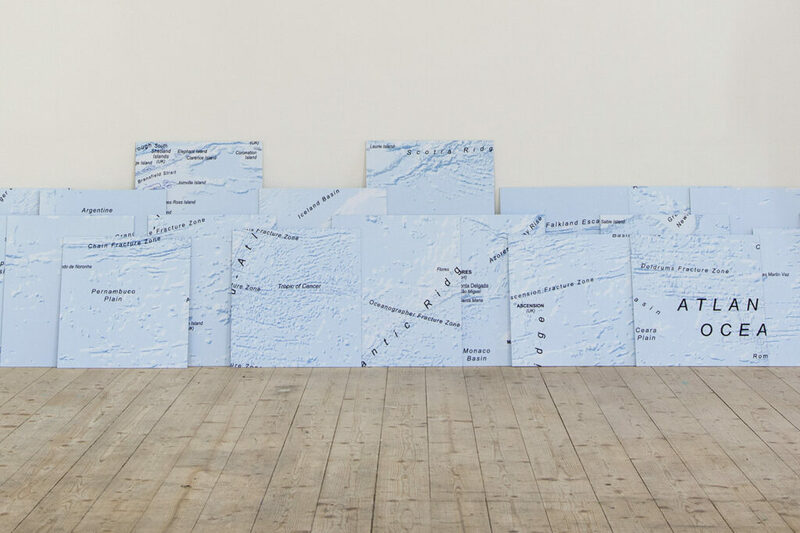 Marina Camargo’s cartographic spatial unutterable situates the world between Wittgenstein and Robert Smithson, who established the disturbing nonsite (e.g., Mono Lake Nonsite, the map frames the nothingness) and Folded Map (1967). In the line of unheimliche cartography, as an indicator of her experimental deviations, Camargo is interested in situationist, simple maps, yet loaded with concepts, like “continuous drift”. The tectonic side Gravity on the Equatorial Line [Gravidade na Linha do Equador] installs the parts as fragments of a seismic convulsion or other geological phenomenon. Absolute collapse. The most minimalist maps appear to be an Earth without light at a time prior to the Fiat lux! They lay like Magritte mirrors (La Clef de champs). The geography is crossed by a cutting strike at the height of the equator. However, the intense brightness that shines comes from Malevich’s sun. Camargo’s monochrome map gives the black the same strength of presence as the suprematist sun, a black square, with no light and shadows of the world’s terrain. What map is this? 14 Questions. Afasia. Maps have a phonetic destiny, or is a map for aphasic, aphonic, mute, laconic, catatonic, mussitating geographers. Alice Lispector. “I suddenly got so distressed that I might just say enough already and finish what I’m writing to you, it’s more based on blind words.” (Clarice Lispector, Água viva) A library without words would gather Alice’s surprise: What is the use of a book, without pictures or conversations?,  the reservations of Memórias póstumas de Brás Cubas, by Machado de Assis, the Livro da Criação, by Lygia Pape, Água viva and Gravity on the Equatorial Line. Bolívia. In the crisis of power, Camargo’s planisphere mocks the British Crown. Cartas onfálicas [Onphallic Letters]. How can one resist against the tendencies of cultures seeing themselves at the centre of the universe? Cone austral [Austral Cone]. The South American way, a Carmen Miranda movie, offers a key to a perverse geodesy in the context of American diplomacy in relation to the New State in the Second World War. Contra-Sul [Counter-South]. In the counter-margin, Buckminster Fuller’s Dymaxion car is bewildered, the projection of Earth on a polyhedron, which is separated in a mesh of forms and takes the planar condition of a two-dimensional map. Convulsões linguísticas [Linguistic Convulsions]. Maps in art engage metonymic displacements, condensed synecdoche, in brief, devastation of the semantic field. The lexical system is open, but the horizon opaque. What is this that does not name and we cannot name? It is the negativity of the Map not to indicate from Art & Language. Eloquência [Eloquence]. Silent, Gravity on the Equatorial Line is vehemently on the darkness and perplexity axis – the black alludes to the absence of North/South dialogue. Escotomia surda [Deaf Scotoma]. Mute maps blind you. Fronteiras sígnicas [Borders in Signs]. Here one can distinguish the Sertão (Brazilian northeastern hinterlands), the Sahara, the Pacific, the Antarctic and the Amazon, Mirosław Bałka’s How It Is reliefs. Cartographic perversity obscures everything. Like the ninth plague of Egypt, the world is in darkness – the caliginous triduum of the Exodus symbolises the submission of the pharaoh, imperial power of Egypt, the Yehweh. Roteiro à espera [Road Map Awaiting]. There are melancholic maps, scenes for a solitary Beckettian geography, lit by Nerval’s Black Sun. Oikos, Babel, of the empire of the Sun King, missiles, web, meteorology, exiles, diasporas, religious fundamentalisms, volatile capital, contraband, drugs trafficking, terrorism, epidemics, is in Gravity on the Equatorial Line. Vácuos cruéis [Cruel Vacuums]. The map is not a hypostasis of space, but rather a mode of knowledge. Its substance is vacuous, voids, the lacunary/non-lacunary dichotomy (lacunary or gapped maps bear the deliberate work on negativity) / (all constructive anticipation, like Clark’s Bichos, is non-lacunary, or gapless), holes, cuts, amputations, folds, rips, the rabbit hole in Wonderland, annexations, subtractions, concealments, lies, desertions, diplomatic treaties, oblivion, Mondrian’s letter to Clark (“Through this ‘empty fullness’ the awareness of metaphysical reality came to me, the existential problem”), the poetry of Paul Éluard (“Ta chevelure d’oranges dans le vide du monde”), Nel vuoto del mondo (Schendel’s drawing), the vase and death overwhelm the cartographic plasticity of Marina Camargo. Marina Camargo unravels Bachelard’s doubt about the existence of a dreamy geographer, who would step forwards as Atlas to hold up the mountain, but the maps, rather than evaporating, condense the meanings. Art, in the world with no facies, is the effort to transform invisible humanity of the homo sacer into a place for everyone. Focus on Camargo’s well-established cartographic positions, such as in Topophilia or contaminations between space and thought [Topofilia ou contaminações entre espaço e pensamento], is avoided. Camargo reads Karl Schlögel (In Space We Read Time), who deals with spaces and places as historical factors with equal relevance as held by temporal questions of the narrative. In How to make a desert [Como se faz um deserto] and Treaty of Limits [Tratado de limites] (which includes the toponymic Place: Tacuarembó), she names concrete places: the sertão (Brazilian outback) and the pampas. The chiasmus now lies in the friction between precise place and toponymy. Lothar Baumgarten considers the colonial toponymic reduction of the invaders against the native populations in relation to language (America and Amazon). Camargo disassembles Mercator’s mesh of perpendiculars and parallels when projecting the Earth. Her fascination arises due to his “opening up of distorted readings of the world and facilitating navigations. His cartography is a reference by opposition to an established truth against which we should take a stance.” High Sea [Alto mar] reacts to Mercator, tackling the notion of a mesh of modern art. The Sertão with no economic value. Camargo’s spaces, interpreted from an affective point of view, not through determinism or historicism, are sustained on dense theorizations of the mappable and their artistic conversion to defend the change in perception through places. The suffix emia originates from the Greek emein, to vomit. Camargo’s map does not establish the place of the scene (like in Geiger and Varejão), for she is interested in the devouring of the map itself, its deglutition and vomit converted into spatial movement. The map gains folds in accordance with its use. Camargo, To the south, below the equator [Ao sul, abaixo da Linha do Equador], (dis)orientates and divides the map by the fold. See Internationale Situationniste, 1958, # 1 and 2. Paris: Librairie Arthême Fayard, 2004, fac-similar reprint. Mussitation is a disturbance characterised by repeated, very quiet, monotonous, murmured speech to oneself, often unrecognised. In 1867, the British ambassador was humiliated by the Bolivian caudillo Mariano Melgarejo and sent back to London. In retaliation, Queen Victoria ordered her troops to crush La Paz. When she learned that the city was up in the Andes and out of reach of her cannons, Victoria crossed the country out on the map and declared “Bolivia does not exist.” JACOBS, Frank. “How Bolivia Lost Its Hat”. The New York Times, 3 Apr. 2012. Camargo’s umbilical cartography is ambiguous. 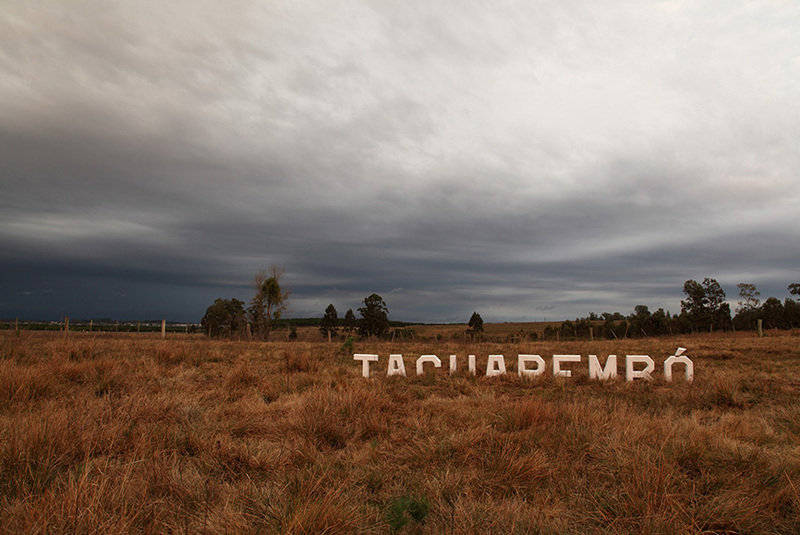 She seeks the centre (Omphalos mundi) in Tacuarembó as a pro-Charrúa and Guarani e ort on the territories lost in the colonial invasion, but she flees from Mercator’s centralization. 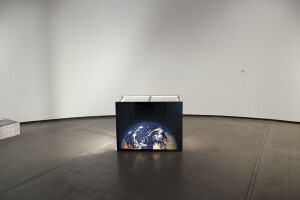 Following the Cuban Revolution, the realignment of Argentina, Brazil, Chile and Uruguay with terrorism generates a cartographic anthropophagy: the ragged entrails of Terminus, Maiolino’s South America; the South American Triangle by Bruce Nauman, a torture instrument and Introdução a uma Nova Crítica by Cildo Meireles. The mourning of Gravity on the Equatorial Line refers to the whole space of oppression. The map is always a deformation. Dymaxion reduced the distortions in the dimensions relative to the regions of the world (like in Mercator and Gall-Peters), there is no direction that points upwards. Fuller argued that in the universe there are no directions such as up and down, or north and south: only inward and outward. Nonetheless, Borges claims that “every Argentinian knows that the South begins on the other side of the Rivadavia” (O Sul), whereas, on the other side of the Prata, Torres-García argued “nuestro norte es el Sur”. Gravity on the Equatorial Line fixes the base of all pieces of the world in the same direction as the imaginary line that bisects Earth, situating Marina Camargo between Borges and Torres-García. In the world of cartographic excesses, Gravity on the Equatorial Line does not map. Beyond being non-informative, Camargo’s cartography attains absence of the figural. Her perverse project is the unmappable, a Wittgensteinian map under the unspeakable of the Place. The stalemate of the contemporary, the saga of migrants and refugees with nowhere to go, the cut-off that splits lost cultural times (through the enslaved Africans sold in the Americas) are letters about an inhuman geography marked by violence, hardship and natural disasters. The desert planisphere of light and letters might be the threat to the 21st century Anthropocenic planet. In the chiasmus of senses, Gravity on the Equatorial Line annuls the counterpart of the Saussarian auditory image. It renders speechless. Moreover, Camargo’s map is no good for nyctophobics. HERKENHOFF, Paulo. “Mirosław Bałka, the iluminating darkness of How It Is”. In: SAINSBURY, Helen (org.). Mirosław Bałka, How It Is. London: Tate Gallery, 2009. p. 50-105. The map in mourning, fractured by Camargo, is an allegory of the power of the nation States and tribal wars devastating societies, driven by an urge to death. For Camargo, the map does not hypostasize space, the substance of which is empty. On the flip side of the delirious economy of Borges’ cartographic hyperboles is Beckett’s economy of vacuums and lapses. Artaud alludes to a certain absent void, between Borges and Beckett. Gravity on the Equatorial Line proposes, therefore, to be the absent void. See DERRIDA, Jacques. A escritura e a diferença. Translation: Maria Beatriz Nizza da Silva. São Paulo: Perspectiva, 1995. p. 150. Vaccuum comes from the modern Latin vacuus, not occupied; void comes from a French dialect vuide and from the Latin vacare; lacuna is unfilled space, from the Latin lacus, lago. BRAYER, Marie-Ange. “La carte lacunaire et espaces de l’art”. In: Cartographiques: Paris, Réunion des Musées Nationaux, 1996. p. 186. BENSE, Max. Pequena estética. São Paulo: Editora Perspectiva, 1971. p. 220. In Cruzeiro do Sul, Cildo Meireles evaluates the meaning of the Treaty of Tordesillas. 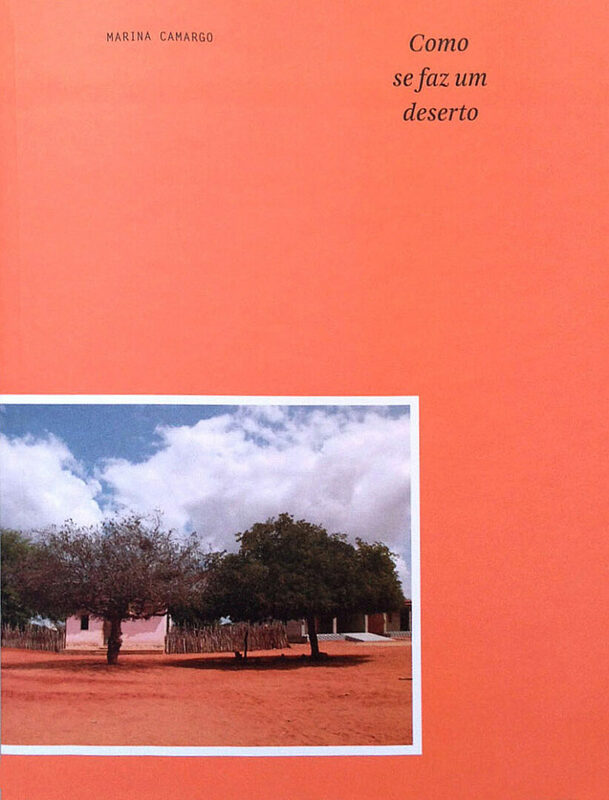 “The empty map of the Brazilian Sertão in the XVI-XVII centuries, or the denial of historical memory in Germany are two different ways of addressing spaces and forgetting.” Marina Camargo in Topofilia ou contaminações entre espaço e pensamento. Tania Rivera discusses how Lacan, in Seminário 7, takes the Heideggerian example of the vase, constructed from its emptiness, to conceive the subject of art. RIVERA, Tania. Ensaio sobre a sublimação. Discurso, n. 36, p. 321-324, 2007. I prefer to think of Gravity on the Equatorial Line under the notion of informational vacuum and not void, the connotations of which are poetic, existentialist, psychoanalytical and metaphysical, involving how the term void has been used in modern western history. BACHELARD, Gaston. La Terre et les rêveries de la volonté. Paris: Librairie José Corti, 1947. p. 361. “(…) the myth of Atlas is a myth of the mountain.” Hence, Alpenprojekt. Text originally published on the catalogue of the exhibition “RSXXI – Rio Grande do Sul Experimental” curated by Paulo Herkenhoff, on June-July 2018 at Santander Cultural – Porto Alegre, Brazil.